As Solapur is a famous tourist location, there is no difficulty to find out good restaurants in and around the city. Solapur homes several temples that attract many pilgrims throughout the year. So, most of the restaurants here serve pure vegetarian food. Some of the most famous pure veg restaurants in Solapur are discussed here. You can taste interesting dishes such as coriander delight, khichdi curry, rice dhokla, small size kacoris, slender potato rolls and fruit custard here. It also provides nice ambiance with outdoor seating. Portico Lotus accepts credit cards. Jay Palace serves all types of vegetarian food like fresh puran boli, dhapate, jwari bhakari, pithle, ground-nut chutney and curds. Air-conditioned family dining hall here provides a nice ambience. Payment is accepted only by cash. Priyanka Restaurants serves Indian, Chinese, Hyderabadi cuisines. It also provides catering services, home delivery, candle light dinner and birthday parties. 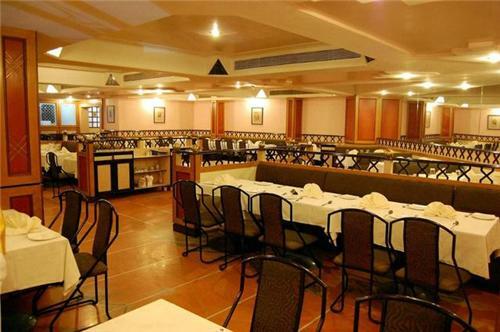 Celebration Restaurant is a multicuisine restaurant that serves cuisines at an average rate of Rs 350 to Rs 750. Home delivery and buffet facilities are the other services offered by this restaurant. It is a pure veg Thali restaurant that serves food at an average rate of Rs 350 to Rs 750. It is an AC pure vegetarian restaurant with facilities like bar, valet parking, security services, smoking area, birthday parties etc. You can try pure veg thali, Gujarati thali and inexpensive fast food at a rate below Rs 350. This pure veg restaurant serves multicuisine and fast food at an average rate of Rs 350 to Rs 750. Home delivery, buffet services, bar and smoking area the other features of Hotel Shivlochana Restaurant. Punjabi, Gujarati, South Indian, North Indian and Chinese cuisines are served at Hotel Yash palace at a moderate rate of Rs 350 to Rs 750. It serves inexpensive pure veg, Punjabi, South Indian, Chinese restaurants at an average rate of Rs 350. Tandoori cuisines are the special items in Sanskruti restaurant. Average cost for a meal for two is Rs 300. You can pay the bill by cash, visa card, credit card, debit card and master card. It is an inexpensive pure veg restaurant where food is available at a moderate rate of Rs 350 to 750. Cash, American express, Master card, Debit Card, Visa card and Credit Card are accepted for payment. Try delicious Chinese, south Indian and north Indian cuisines from here at an average rate of Rs 350. Anapurna restaurant serves Maharashtrian and Chinese cuisines at an average rate of Rs 350 to Rs 750. Outdoor seating, home delivery, valet parking and security services are the other main features.